Reading Between the Lines (Gijs Van Vaerenbergh). Photo by Kristof Vrancken. Source: dezeen.com. It can be assumed that the architectural space is fundamental in all cultures, that is, it is not something exclusive to a historical period or specific group. Space, as a giver of meaning, since its beginnings and according to its functions (social, religious, safe-keeping, etc.) is connected with the function of residence and the organic relation with the surroundings, and, of course, the human body. Therefore, it can be stated that the first structurally complex spaces establish a relation between the astrological and, let’s say, the architectural (Stonhenge, the pyramids of Egypt; the monument with a crescent moon-shape, recently discovered in Israel); while later on the architectural theory was concerned with the proportion between the body and the building (LeCorbusier). These relations grant a cosmogonic meaning to space and weave other symbolic relations between it, the outside world (the surroundings), and, of course, the community. Today, these elements have transformed due to the character of our times, its discourses and symbolic structures. Instead of being the community a reference point for the individual, now the individual and the things connected to him are such reference point –in addition to the growing efforts in making the expressive codes uniform, even in the case of architecture, due to the market and the corporate image–, which determines the construction of new discourses. Instead of having the dominant discourse –like it was the case in the Modern Era– putting architecture at its service as an esthetic and functional instrument, now architecture becomes an architectural motif; turning to functionality from its material, perceptual, and, of course, esthetic elements. However, a personal judgment about the space and the community would prevail above the historically established discourse, and, therefore, it modifies the latter; it modifies its perception, its value, its meaning. Something similar to the Romantic Movement from the 19th century, but with the purpose of consummating this relation between the individual and the symbolic space from the particular view of the architect, more than a formulation from a historical and ideological discourse, as it is the case with tradition (even theoretical). This is what Hans Ibelings would say in 1998 about the turn-of-the-20th-century architecture: “alike postmodernity, deconstructivism rests on the pedestal of symbolic meaning, at the same time that the architectural shape is conceived as metaphorical”1. Today, while these categories seemed to have gone by swiftly, at least some of their ideological elements can be read in recent architectural works, due to the fact that they are still contemporary. 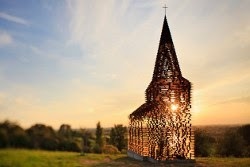 This is the case of Reading between the lines by Gijs Van Vaerenbergh, a landscape project in Limburg’s province, Belgium, realized in 2011 and representing a local church. It would be good to say a word or two about the architectural movements of the final years of the 20th century and about what happens today with works such as this, because it also allows us to understand the purpose of its meaning – mainly when historical and theological concepts mix, somehow, in a secular work. Postmodernism and deconstructivism are two important movements from the final years of the 20th century due to the fact that they appear in the globalization era. This represents the contemporaneity of Reading between the lines and the ideas that it provokes today with such movements –besides being somewhat close in time, and, in a way, inside the debate that is still provoked in the humanities by the concepts of modernity, postmodernity, among others (like supermodernity or transmodernity)2. For example, the architectural movement called deconstructivism sought, according to the philosophical ideas of Jaques Derrida, to make of metaphysics a work per se –that is, the physicality of the metaphysical. Roberto Masiero says that “[de]constructing thought implies also the deconstruction of the place where thought resides: architecture”. And he adds: “If deconstruction implies to be free from the bindings of metaphysics, it is necessary (rather than possible) to deconstruct architecture with the same “movement”: architecture as a symbol of metaphysics would then be desymbolized, and the deconstruction would not be then a program, method or technique –under the risk of falling back into metaphysics–, but an event, with all its spontaneous character”3. Under this theoretical aspect, if the place –the building–, as a residence and construction of a group’s identity and, hence, of the individual, was rooted in a somewhat uniform ideology or system–such as, for example, a religious one–, the depriving of metaphysics in philosophy (not only of the world of ideas, but also of God himself in the secular world) would make of a symbolic architecture nothing more but an esthetic sign in which transcendence did not have a place to exist. Still, Hans Ibelings considers this movement to be a brief one and questioned by the many architects that were included in the exposition Deconstructivism Architechture at the MOMA (1988). However, some of the elements taken from Roberto Masiero, mentioned previously, serve as a backdrop to interpret some aspects of Reading between the lines4. Following Ibelings, the mentioned movement, postmodernism, would be considering a marked emphasis in the context of architecture related to its surroundings. This combination of elements plays an important part in Gijs Van Vaerenbergh’s work of art, which we will deal with below. Marc Augé’s no place notion is well known. In his work, he expresses the following: “If a place can be defined as a place of identity, relational and historical, a space that cannot be defined neither as an identity space, nor as relational or historical, will define a no place”5. Thus, the author speaks of crossing places such as hospitals, airports, public transport stations; trains, among others. Of course, a building can be considered as a no place, and, in the case of Reading between the lines one could wonder if it is a building, as such. In fact, a paradox is glimpsed: it is, at the same time, an ornamental construction that flirts with the sculpture or an element of the landscape, while it mimics the conventional structure of a European church. Is it a no place, then? Not in the sense of crossing place, but at least it gets close to it in the sense of the game of construction of a religious identity that disappears as an aspect of a cultural heritage. Ibelings considers that the movement that represents the final years of the 20th century is supermodernism, a borrowed term from Marc Augé, the anthropologist author of the “no place” concept. It seems that the characteristic aspect of the architectural supermodernism is its neutrality in its formal appearance, making itself apart from the traditional ways of representation that, just for their facade, the buildings told something about the things that lied indoors. Ibelings says: “today’s architecture is conceived more and more often as an empty medium”thath often than not as a vaccum medium" ways of representation that,sticaldeas, but alson of a groups identityof modernity, pos6. Yet, unlike the architecture of the supermodernism movement, Reading between the lines is not an “octagonal box” that seeks transparency by using sophisticated materials with abundance of crystals (and that, although the latter suggest transparency, one cannot determine if it is an office building or a museum). It is, rather, completely transparent using just one material, iron (30 tons and 2000 pillars). The use of iron would only be arguing about lasting things in contrast with brief ones. But it is that we expect it to be a functional construction, as an inherent element to all forms of architecture, because, precisely, it has no walls nor it intends to have them; it was not made to house things, but to be contemplated, hence its name. The building is, hence, the appearance a church. We could well distinguish it by using the category that Jean Baudrillard used to identify postmodern things: the simulation. However, the building does not only mimic a church from its facade, but it also pretends to be one. There is certainly a deceit in the form of a game of meanings of the church as a building in the history of Europe. From its communicative aspect, the question arises. The transparency of its walls and the lack of stacking of materials in the lower area make it look like it was floating, almost virtual. Hence, its contemplation is more precise from a distance. Something similar to the visual effect produced by the impressionist painting, but without a representation of the reality of the light falling onto objects and the world, but just letting it cross over. Impressionism still marks the secular life of the final years of the 19th century (Monet’s cathedral is not an inspiring painting about the values of Christianism, but only light); this landscape project from the 21th century neutralizes the historical and functional value of church; it is, in itself, an object, and in its character it shares with supermodernism the lack of substance that is stressed through transparency7. The crossing of the light as a visual aspect and air as a tactile element stress the sense of deprivation and emptiness: of transparency and suppression of meaning. The symbolic and semiotic value of church has disappeared in its nihilistic reflection. It is an irony, because we can see through it and there is only transparency. It is a space of which we cannot say that it has been desacralized; rather, it carries the ideological effect of secularizing completely what is sacred; it is not even made a monument –which, instead of making it trivial or esthetic, it would made it monstrous–, but rather disappearance and object, as the architectural firm itself, which considers it an element of the landscape. This is the starting point; the immediate reference to its meaning. The landscape motif has been turned into the image of a church. Conversely, the church and Christianism, instead of being re-signified through Reading between the lines, it is the landscape the one that is adorned with the empty and translucent figure that holds as referent a church. Here, the spontaneity of its localization almost gives it the status of sculpture, but the signal to its immediate referent is inevitable: the European church, and, by synecdoche, Christianity and christianism (without mentioning that the model for this construction was a local church). It is something similar to what the Egyptian poet Edmond Jabès named, when speaking about his own poetic work and stance in front of his own religious tradition: a Judaism after God8, in the sense that this work also uses and questions the aspects of the representation of the sacred. Could we not rather be before a spirituality of the landscape and of strolling...? The irony that the work produces (this would be the most appropriate way of referring to it) places itself in front of historicism and the religious (and the forms of representation of the discourse of the latter) by depriving the meaning of church as an architectural construction and inserting it as an element of Limburg’s local landscape: a transparent church, not in a political or even artistic sense, but rather because it is literally empty and its presence is an esthetic element of the landscape. Evidently, it is not a church, neither as a construction nor as a place of religious calling; it does not congregate the ekklesia, formed by the Christian believers who are linked theologically: its function is purely esthetical. Perhaps, this esthetic and predominantly visual character is a clue that the church, as a sign, is also a secular property to the point of being an ornament of what is empty and even unreal –through that almost virtual and phantasmagorical appearance– of the institutions of the sacred and divine –of God– in the Western world. Ibelings, H. (1998). Supermodernismo. Arquitectra en la era de la globalización. Barcelona: Gustavo Gili. Jabès, E. (2000). Del Desierto al libro. Entrevista con Marcel Cohen. Madrid: Trotta. Masiero, R. (2003). Estética en la arquitectura. Madrid: A. Machado Libros. This article was translated by Nicolás Manfredi and reviewed by Fernando Bernal, under the grant “God's Evolution” awarded to the Science and Faith Centre (Spain) by the BioLogos Foundation (USA).